Climbs: Conquer Alpe d'Huez, the Col de la Croix de Fer, Col du Glandon, Galibier and more...! Start/Finish: This is part of our 2 week Nice to Alpe d'Huez cycling holiday - click here for full details. WE HAVE SECURED 4 NIGHTS PRIME LOCATION HOTEL ACCOMMODATION ON ALPE D'HUEZ SO YOU ARE AT THE CENTRE OF THE ACTION AND ATMOSPHERE! the penultimate stage of the 2015 edition of the tour de france will be 100km of pure drama. we cheer the riders from the best position on the side of the mountain - an unforgettable experience! Riding: Ride each day - complete loop rides from our hotel of varying distances (your choice!). Loops include the Croix de Fer, Alpe d'Huez and Col du Galibier and Lautaret. We also have an intimate knowledge of lesser known climbs to stunning villages & spectacular views. We stay on the mountain: Our hotel is booked nearly a year in advance - it is a real privilege to stay on the mountain, amongst the atmosphere and action of the Tour, the teams and their support vehicles. We have 10+ years experience running tours to visit the Tour de France, so we ensure you are in the best locations to view the race, understand how road-closures work, sort out the food and cold drinks and organise road-side picnics and BBQs (being Aussies, we always make sure there's always a cold drink on ice)! Catering: Evening meals are at our hotel - 3 courses of 'cyclist-sized' meals. We have daily buffet breakfasts to set us up for the days ride ahead. Secure bike storage: At our cyclist friendly hotel. Experience: These 3 days viewing the Tour de France forms the final part of our 2015 Nice to Alpe d'Huez Cycle Tour. Not only do you get to see the Tour but you spend 10 days cycling through the most beautiful regions of France from the Mediterranean to the Alps! It's the ultimate holiday and Tour experience. The Tour de France is the world's largest annual spectator event and the 2015 edition is shaping up to be a race for the climbers, with seven mountain stages and five mountain top finishes. It is likely to be a battle between Froome, Nibali, Contador and Quintana. There is also a whole new generation of Aussies who are capable of big things and there's a chance they could shape the outcome of the Tour. 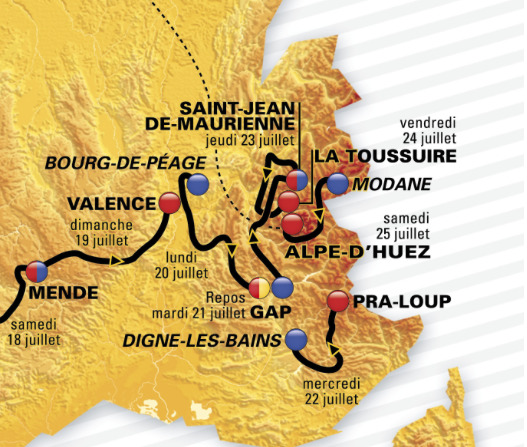 As part of our Nice to Alpe d'Huez cycling holiday, we will watch the final 3 mountain stages in the French Alps. Watching the Tour on Alpe d'Huez is an experience not to be missed! Over 1 million spectators will line the 21 hair-pin bends from Bourg d'Oisans at the foot of the climb to the stage finish in the village at the top. It's a 13.2km climb averaging 8.1%, steeped in history, with each hairpin bend named with a pervious winner of the mountain. In 2015 this will be the final climb of the Tour de France and full of drama - potentially where the Tour is won or lost!